Elliot is two months old! He got his first major round of shots yesterday at his two-month appointment and he handled it pretty well (although the nurse who gave them was a total ninja and I could have sworn I only saw her give one shot!). He did cry a lot at first, but a little nursing helped and he was just a little fussy later in the day. I had planned for lots of fussiness, so we spent most of the afternoon snuggling. And he got that awesome Wonder Woman bandage (the other leg has Superman). I’m doing okay with the whole taking-care-of-a-baby-during-the-day thing. Last week was nice because Dan only had to go to work two days (he had off Monday and Wednesday for a holiday and snow, and had already planned on taking off Thursday for a dentist appointment and some other things), but this week we’re mostly back to the routine. I actually had my first excursion out without Elliot since he was born. I went to the dentist on Wednesday while Dan stayed home with him. Apparently, he mostly just napped and then woke up to have a bottle right before I came home. I was a little worried, but the amount of work Dan has put into helping care for El when we’re both home left me totally confident he could handle it. Now that breastfeeding is more established, we’ve started introducing bottles of pumped milk in preparation for when he officially starts daycare later this month. The spot we got in the daycare started a month before I go back to work, so we can ease into it, sending him one or two days a week to get used to it, but the one thing is that we want to be sure he’s comfortable with the bottle before then. So I’ve been pumping a little bit between feedings to build up some extra milk to give him for one feeding on days when Dan is home, and then I pump while he feeds El. So far so good, but who knows what will happen to my supply when I’m actually back at work and pumping for at least three feedings per day. Therapy has been going well. My therapist has even checked in on me via email when she knows something stressful is coming up. And my OB gave me a very low-dose prescription for Zoloft, which I’ve been taking for two weeks now. It’s not clear that it’s helping, but at least the initial side effects only lasted a couple of days. I’ve been feeling a lot better lately, mentally, and it’s probably some combination of the treatment and just feeling seen and supported. El continues to grow and develop and it’s adorable. He’s sleeping well at night, and we’re currently working on naps. We set up a Pack ‘n Play in the living room so he can nap in a separate area from his play area. He can do half-hour naps with no problem, but longer naps remain mostly elusive (although he napped for an hour after his shots yesterday). 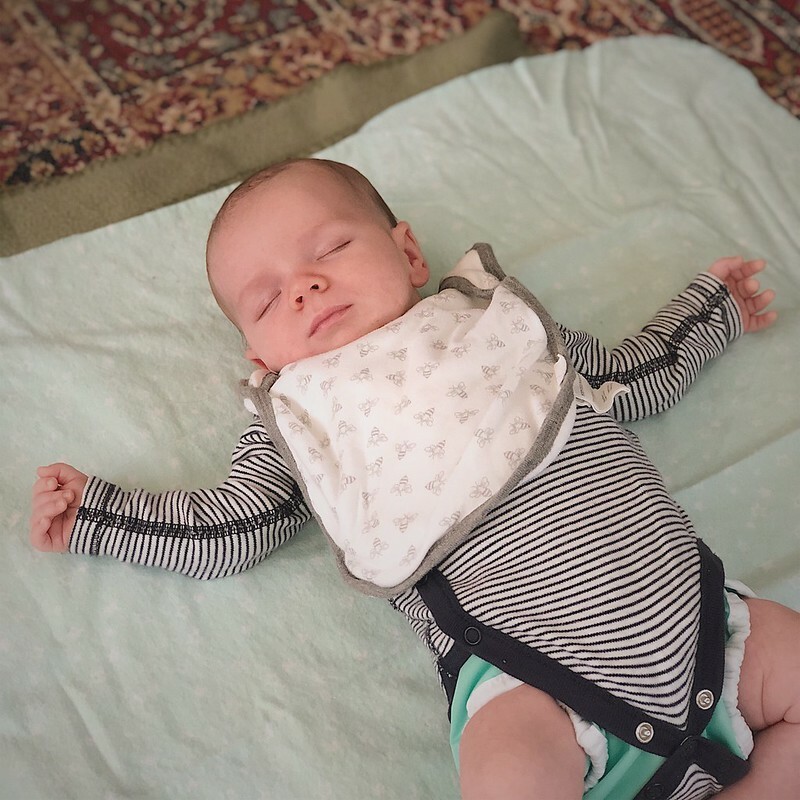 But I’ve heard that no matter how well they start sleeping early on, it all changes at four months anyway, so I’ve been pretty relaxed about letting him nap in the ring sling or on me. He still tends to get fussy in the afternoons and wants to be held a lot, so the ring sling has been a lifesaver for me. I’m getting more confident with him in it by the day, and even made part of dinner the other night while wearing him. This week we haven’t gotten any walks in, but we try to take a couple walks per week at least most weeks, which he appreciates until he falls asleep. He’s also discovered his hands. The other day when he woke up from his nap, he wasn’t fussing, so I let him stay in the Pack ‘n Play for a little bit and when I looked in, he was just examining his hands. He’s also started “talking” a lot, making “boo” and “goo” and “gah” sounds. He also says “ow” a lot, which I like to think is the sound he thinks his mumma makes because I did say it a lot in the first month of my recovery. Other than that, we’re just hanging out most days. We still play and “chat” and do tummy time a few times a day, plus he likes his Montessori mobiles. And I try to read him a story at least once a day. He enjoys being around people, especially his parents. Now that he’s gotten his first round of shots, and it seems like flu season is calming down, we might start venturing out of the house more. As far as his doctor’s appointment, the doctor said he looks great and healthy and very alert. His weight gain has slowed down a bit, but she’s not concerned, especially since he’s still gaining, and getting longer. He’s probably just going to be tall and thin like his parents (especially his dad!). And we even managed to get him weighed without him peeing on everything and everyone this time! Officially, six weeks marks the end of the “postpartum recovery period,” according to my doctor and short-term disability (actually I get a little longer because I had a c-section). And, honestly, I can kind of see why. It’s been a good two weeks and Elliot is continuing to develop and hit new milestones. But really, I prefer the idea of “the fourth trimester” that extends up to 12-14 weeks postpartum. 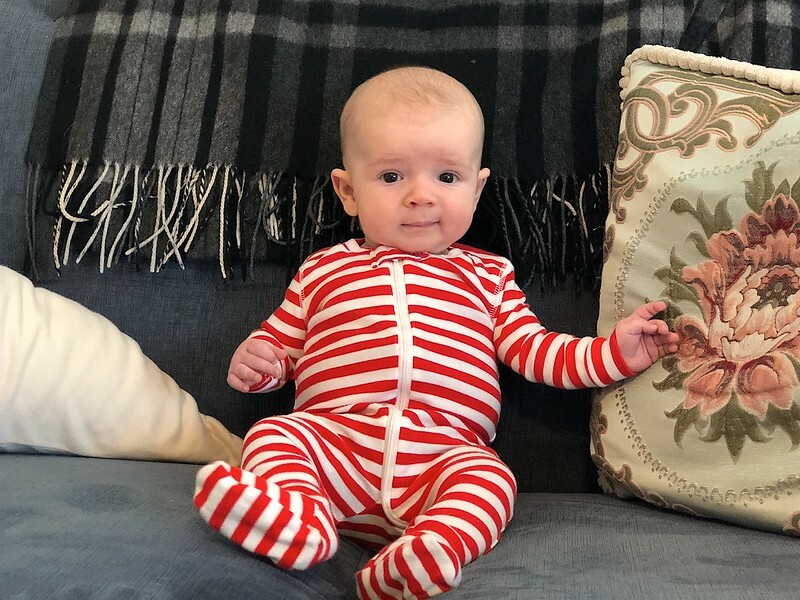 And since I’m taking 16 weeks of maternity leave, I have plenty more time to spend recovering and getting to know El before returning to work. Actually, pretty good. This past Tuesday, I woke up and for the first time since the birth, I felt no pain in my body. Of course, that’s not a constant thing, but I’m starting to have longer and longer stretches of feeling good. When I got over my first trimester nausea while pregnant, I described it as feeling like I had bad days while mostly feeling good as opposed to good days while mostly feeling bad. I think I’m getting to that point. Last weekend, I went for a walk for the first time since the birth. I discovered that I can put El in the ring sling and walk for a mile or two with no problem. It was particularly helpful because I found a therapist within walking distance who had an appointment available. You see, with my history of anxiety and depression, I knew I was at risk of postpartum depression. And when El’s pediatrician suggested I discuss it with my own doctors after scoring my EPDS assessment, I decided to make an appointment. The therapist was lovely and had no problem with me bringing El to the appointment and wearing him while we chatted. Plus, I got to see my acupuncturist because they work out of the same center! And since the therapist started out as a yoga teacher (she went back to school to get a degree because her yoga students kept seeking her out for help she wasn’t qualified to give and she wanted to be able to help), she also had some suggestions for yoga classes I could try. But being active again has helped my mindset more than anything. Being able to get out of the house and not worry about being in pain later is wonderful. Now that I’ve officially been cleared by my doctor (I had my six-week postpartum checkup a couple days ago) for returning to normal activity, maybe I’ll try to get back into my yoga routine, albeit gently. I’m definitely not going to be going back to barre class anytime soon, but at least I can see that going back to barre is in my future, which was honestly a bit tough the last few weeks, as sore as I was. He’s growing and developing and having a great time. He’s definitely starting to spend more time awake for reasons other than needing to be fed or changed. We can actually play together, kind of. I bought some toys, including a set of Montessori-designed mobiles to help engage him during his awake time, and I also brought down a mirror from our bathroom. Plus, he has a great library of picture books from our friends and family (especially Dan’s mother). The favorites right now are the Black and White series by Tana Hoban, which have silhouettes of objects, either black on white or white on black, to be more visible to a baby’s sight while he’s still primarily seeing contrasts. But as he develops, we have lots of other books to share with him. I’ve also started reading to him from books. I’ve read a couple Beatrix Potter stories to him, as well as some of my favorite fairy tales from the storybooks I bought for Kindle. While they don’t have as many pictures and he doesn’t necessarily understand the words, he seems to enjoy listening to me read them. He definitely has started responding to our voices. During the day when Dan is at work, I can calm him down by holding him and singing to him more easily than just rocking him. But probably the most exciting new development is that El has definitely started smiling. He smiles in response to us smiling at him and when he sees certain things. He gave a huge smile at a black-and-white cow toy that a family member gave us for him, so we’ve decided that’s his favorite toy. And he definitely smiles for his mumma and daddy. No matter how frazzled or tired or sore I might be, his smiles warm my heart. Dan says that he feels like he can’t even remember what it was like to not have him around most of the time, and I kind of agree. Elliot is one month old today! And what a month it’s been. Well, I was feeling really discouraged because every time I started feeling a little better, I’d be a little more active, and then suffer a setback and feel like I could barely move. But around last Thursday or Friday I realized that I actually felt much better. I’ve actually started wearing clothing with a waistband again! I’d been in nightgowns, robes, and maxi dresses for most of the month, so wearing a skirt was a big step. And today, I wore leggings to our pediatrician appointment, which is the closest to pants I’ve gotten in a month. But I’m still managing to overdo it. I think it comes from being a pretty active person during my pregnancy. It’s hard to grasp that I was five times more able at 40 weeks pregnant than I am now, without the belly or all the extra weight. I’ve been experimenting more with babywearing because my arms get tired carrying him and Elliot likes to be walked around. I’ve come to the realization that the stretchy wrap is going to have to wait until I’m a little more healed because I’m having back pain after a couple days in a row of wearing it for a bit. But the ring sling seems to work better, probably because it keeps the baby weight distributed higher and doesn’t go around my middle at all. This week marks the last week that Dan will be staying home, so I need to take some time now to try to become more independent with Elliot. I’ve started doing a little more at night, although I still need to make sure I’m standing and being careful when lifting El in and out of his bassinet, rather than being able to just grab him while sitting in bed. But we generally do a diaper change when we feed him at night anyway, so once I take over more of the overnight work, I’ll have to get up anyway. I still haven’t ventured out of the house except for doctors’ appointments, although we have some appointments to tour daycare centers later this week, which should be interesting. I’m hoping I can keep El in the ring sling to minimize his exposure to germs (although I doubt it’s much more risky than the waiting room at the pediatrician). And eventually, I will get out to take a walk in the neighborhood, even if it’s just around the block. Still growing. At his checkup this morning, he’s still firmly tracking the 45th percentile for weight, despite the fact that he’s been feeding for less and less time. I guess he’s just very efficient at nursing. He also got a shot, which he did not like, but he got over. He did spend the first bit of the car ride home looking grumpy in his car seat, but he fell asleep and wasn’t any worse for the wear. He’s also started focusing on objects and faces. He looks at us from further away, and will even pay attention to books and toys. And he’s started smiling at people and things. I picked up a stuffed cow toy to show him during tummy time (because it’s black and white and high contrast) and he broke out in a huge grim when he saw it. He’s also started smiling at us when we smile or talk to him. It’s really exciting because it feels like he’s becoming more engaged with the world. We’ve started getting him toys and showing him some of the (many) books we’ve received as gifts. I got a baby gym frame to hang things from and some Montessori mobiles. The gym hasn’t arrived yet, but I experimented with holding up the Munari mobile for him today and he was entranced for five minutes. Obviously, we’re still in the eat-poop-sleep-repeat phase of newbornhood, but it’s really cool to see the occasional glimpses of the baby that is to come. Oh and he officially weighs more than the cat. Well, it’s been a while since I’ve done a weekly update. Last time I checked in, I was 41 weeks pregnant and looking at an induction in a few days. I’ll be posting my birth experience next week, but I thought I’d start by sharing how our first two weeks with Elliot have been going. So, the postpartum period (or “fourth trimester,” as it’s sometimes called) isn’t just about baby development. It’s also about maternal healing. And I’ve definitely found the postpartum healing period more challenging than I thought it would be. I was completely unprepared for how much pretty much any normal daily activity would hurt with my c-section incision. The first week was mostly spent figuring out how to cope with reduced mobility. Dan has been invaluable, doing pretty much everything except feeding the baby. I’ll be honest, I’m extremely frustrated that I can’t do almost anything. Earlier this week, I ended up back at the doctor for a last-minute appointment because I was having so much pain my lower abdomen. The doctor said I’d probably strained something, and given where I was hurting, I’m pretty sure I hurt myself lifting Elliot out of his bassinet at night. So I had to pull back even further and rely on Dan even more, which didn’t help the frustration (or the fact that we couldn’t really take shifts at night). But we’re slowly adjusting and figuring out a sort-of routine. And Elliot is obliging and letting us sleep for a few hours at a time overnight, rather than staying up all night cluster feeding the way he did the first few nights at home. Well, little guy seems to be having some congestion the past couple of days, but he seems mostly content and healthy. After several days of hourly feeds overnight, he’s calmed down, probably because he finished a growth spurt. In the hospital, we had some trouble with him losing weight too quickly after birth, so we supplemented a little bit of formula after feeding him at the breast, but the day after we got home from the hospital, my milk came in, and he started refusing his formula supplements. 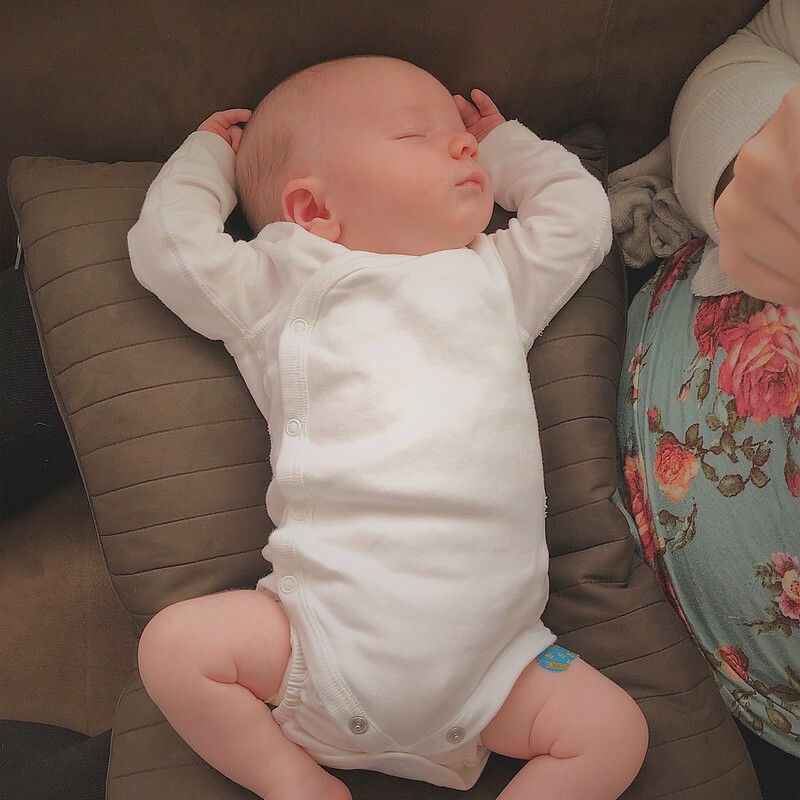 When we had our first pediatrician checkup, he’d started gaining weight again nicely, and we were given the green light to go back to exclusive breastfeeding. 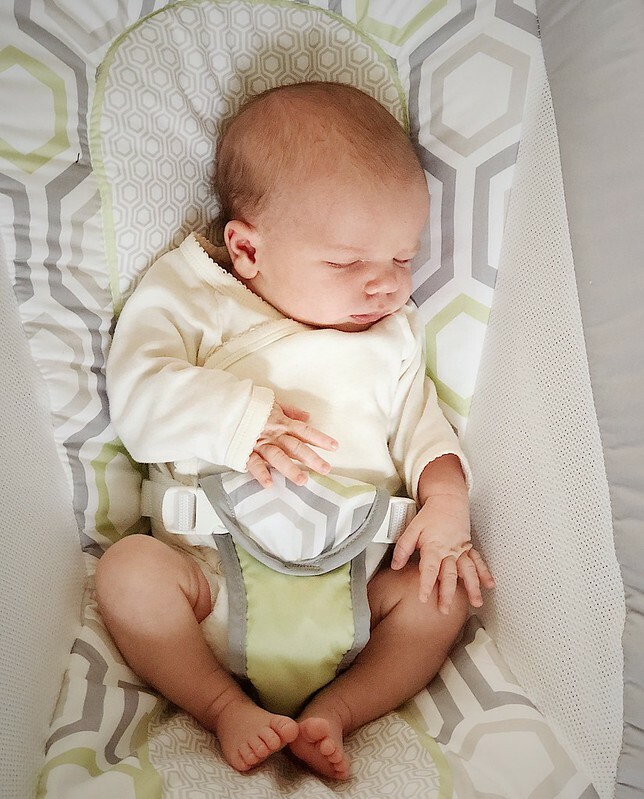 At our two-week appointment this week, he’d already gained back to his birthweight (and then some!) so feeding seems to be going pretty well. Over the last couple of days, we’ve noticed that he’s been a lot more alert and interactive during the day, instead of only waking up to fuss because he’s wet or hungry. His umbilical cord stump still hasn’t fallen off, so we’re being careful with tummy time, but I do occasionally put him on my chest to practice holding his head up and pushing up a little. He has remarkable neck control for a newborn and has since birth (he was holding his head up during skin-to-skin in the recovery room). He’s also starting to noticeably outgrow his clothes. I think he’ll be out of newborn sizes fully in a week or two, though I’m glad we got newborn-sized clothes because the larger size was slightly too baggy for my comfort while sleeping. But our growing little guy is growing like a weed. 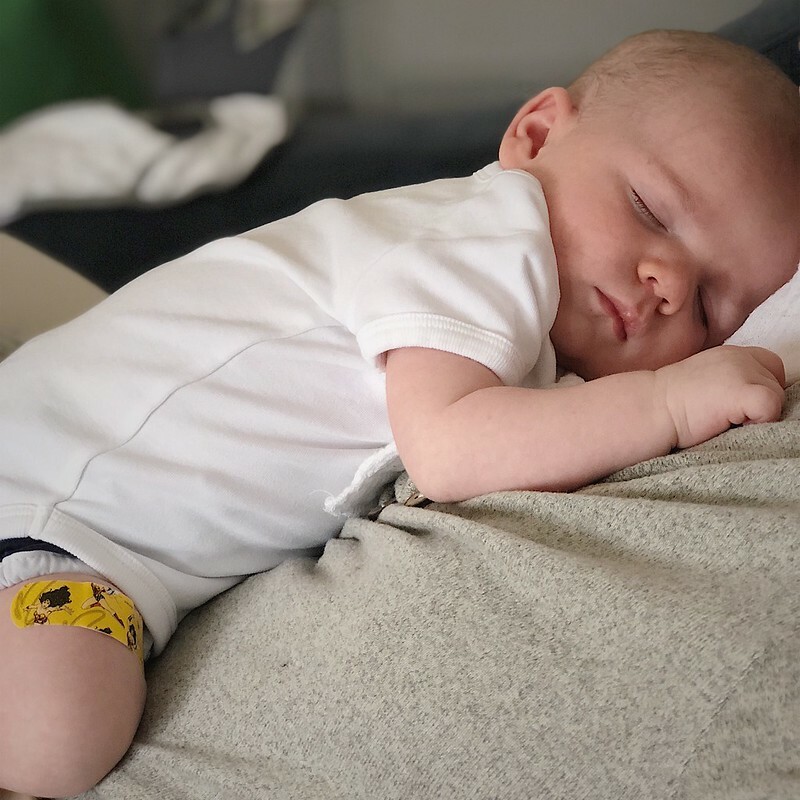 As precious as these sweet, sleepy newborn moments are, I’m excited to see how he develops over the next months and years.